IN-FORM Wagga stayer Hard Go Jo made it two wins in a week with an all-the-way victory at Murrumbidgee Turf Club on Monday. Top apprentice jockey Nick Heywood made another successful trip home as he piloted Hard Go Jo to victory for his father Chris. Hard Go Jo was taken to the front by Heywood and never looked in danger as she raced away with the Royans Wagga Benchmark 60 Handicap (2000m). 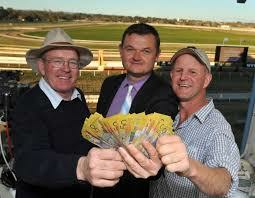 It backed up his win in a Benchmark 50 over 1600m at Wagga last Monday. “The last couple of weeks she has really seemed to thrive, he’s a happy horse,” Heywood said. Hard Go Jo ($4.20) won full of running, finishing 2¼ lengths in front of $3.20 favourite Get Ya Kicks. Rossatin ($17.00) was close up in third. Heywood has no lofty ambitions for the five-year-old mare but will look to find another suitable race soon. “We’ll take it as it comes but she’s ticking over nicely,” he said. Meantime, Wagga trainer Wayne Carroll was among the winners on Monday when lightly-raced Danejar toughed out a big win in the Crust Pizza Maiden Handicap (1300m). Danejar ($10.00) was three wide and wider for the trip but dug deep for Brad Clark in the straight to score in a thrilling finish. The Gary Colvin-trained Magic Mary ($51.00) almost pulled off a major upset, finishing second, while $3.30 favourite Beaujeen was third.